The AFC-NFC Pro Bowl on February 12, 2006 marked the 27th consecutive game in the series to be played at Aloha Stadium in Honolulu. Coaches were John Fox of Carolina for the NFC and Denver’s Mike Shanahan for the AFC. There were 50,190 fans in attendance and they sat in a steady rain that began to fall as the game commenced and didn’t let up until the second quarter. The tone for a sloppy first half was set in the opening series when the AFC was twice penalized for false starts. Indianapolis QB Peyton Manning threw to WR Marvin Harrison, a teammate with the Colts, for a 33-yard gain but the AFC ultimately had to punt. Following a punt by the NFC from its end zone, the AFC had good field position for its next possession but Manning, again intending a pass for Harrison, was intercepted by Chicago CB Nathan Vasher, who returned it 30 yards. Five plays later, the NFC returned the favor when QB Matt Hasselbeck of the Seahawks was picked off by Denver FS John Lynch. The AFC then drove 45 yards in seven plays that featured three runs by RB Edgerrin James of the Colts that covered 22 yards and three completions by Manning, the last to Miami WR Chris Chambers for a 16-yard touchdown. 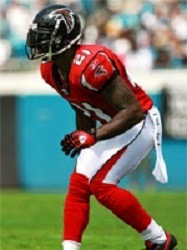 The score was not without controversy as Chambers came down with only one foot in bounds, but it was ruled a catch due to the defender, CB DeAngelo Hall of the Falcons (pictured below), pushing the receiver out of bounds even though it appeared on the replay that Chambers was not touched. Cincinnati’s Shayne Graham added the extra point. As the game entered the second quarter, the teams exchanged punts. The NFC put together a 10-play, 73-yard series as Atlanta QB Michael Vick completed three passes, the longest to WR Larry Fitzgerald of the Cardinals for 32 yards, although Vick fumbled a third down snap to force a field goal attempt. Arizona’s Neil Rackers was successful from 32 yards to narrow the score to 7-3. The AFC responded with a 62-yard drive in 11 plays and resulted in a 31-yard Graham field goal. Vick tossed an interception and Manning threw two more as the first half wound down. The third Manning interception of the game was by Dallas SS Roy Williams, who returned it 11 yards and then lateraled to Hall who picked up 57 yards to give the NFC the ball at the AFC 20. The NFC used up 18 of the last 20 seconds of the half to run three plays, the last of which was a Vick throw to Atlanta teammate TE Alge Crumpler for a 14-yard TD. Rackers added the point after and the score was tied at 10-10 at halftime. Following a trade of punts to start the third quarter, Carolina QB Jake Delhomme passed the NFC into AFC territory, but he fumbled when sacked by DT Casey Hampton of the Steelers and DT Marcus Stroud of the Jaguars recovered at the AFC 49. However, three plays later a pass by Kansas City QB Trent Green was intercepted by LB Derrick Brooks of the Buccaneers (pictured at top), and he returned it 59 yards for a touchdown. Rackers added the PAT and the NFC held a 17-10 lead. The AFC had to punt following its next possession but got the ball right back thanks to a fumble by WR Santana Moss of the Redskins at the end of a 20-yard run that was recovered by Denver CB Champ Bailey. In a series that extended into the fourth quarter, the AFC went 68 yards in 10 plays as Green completed three passes and RB Larry Johnson, also of the Chiefs, had a 20-yard carry. Green ran for the last yard and a TD and, with Graham kicking the point after, the score was again tied at 17-17. The NFC drove 59 yards in 13 plays before facing a fourth-and-two situation after a Hasselbeck pass to Atlanta RB Warrick Dunn picked up 14 yards to the AFC four on a third-and-16 play. While the crowd booed the decision to settle for a field goal, Rackers connected from 22 yards to put the NFC back in front by 20-17 with 6:29 remaining to play. The next two AFC possessions ended with QB Steve McNair of the Titans fumbling the ball away, with Philadelphia LB Jeremiah Trotter recovering the second at the AFC 18. A Vick bootleg on a third-and-17 play picked up the necessary yardage for a first down at the eight, and the series ended with Rackers kicking a 20-yard field goal to make it a six-point game with 1:13 remaining on the clock. McNair came out passing for the AFC and two completions got the ball to the NFC 49. But the next three throws fell incomplete and McNair was sacked on the last play of the game. The NFC won by a final score of 23-17. There were 10 turnovers in all, with six by the AFC. The AFC’s turnovers came on four interceptions and two fumbles, and while the NFC fumbled six times, only two led to turnovers in addition to two interceptions. The NFC gained the most total yards (279 to 260) while the AFC had the edge in first downs (19 to 18). Matt Hasselbeck completed 10 of 17 passes for 85 yards and no touchdowns while giving up one interception. Michael Vick was four of 12 for 69 yards and a TD while also being picked off once and ran for 17 yards on two carries. Carolina WR Steve Smith had 8 catches for 46 yards. RB Tiki Barber of the Giants led the NFC with 33 yards on 11 rushing attempts. 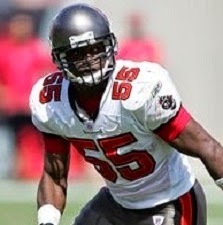 Derrick Brooks, playing in his ninth consecutive Pro Bowl, was named MVP of the game due to his key interception for a touchdown. For the AFC, Peyton Manning was successful on 13 of 26 throws for 139 yards and a touchdown, but gave up three interceptions while Trent Green went to the air 11 times and had five complete for 39 yards and one interception. Kansas City TE Tony Gonzalez had 5 pass receptions for 36 yards and Marvin Harrison gained 74 yards on his four catches. Larry Johnson rushed for 33 yards on 8 carries. The win for the NFC, which had lost four of the previous five contests, tied the series at 18-18 since it had gone to the AFC vs. NFC format following the 1970 season.